With most of NFL free agency in the rearview window and the NFL Draft still a few weeks away, we have officially reached the point of the offseason where everyone is doing the same thing, and that thing is begging the NFL to release the schedule. The NFL has basically turned the release of its schedule into an annual event, but the problem this year is that the league still hasn’t announced when the schedule will be released, which is starting to make some people antsy. Also, Amy here would like to know when the schedule is going to be released so she can start planning her fall vacations. waiting for the NFL schedule any time now @NFL. I got vacation to plan! The good news for everyone is that the schedule will be coming out soon. Now, just because the schedule’s not out yet doesn’t mean the entire thing is a complete mystery. As a matter of fact, we actually know quite a bit. However, before we get to that part of the story, here’s a quick reminder that you can check out the 2019 preseason schedule by clicking here. Now that we’ve got that out of the way, let’s take a look at 10 things we already know about the 2019 regular season schedule. For the first time in six years and just the second time since 2003, the defending Super Bowl champion won’t be hosting the first game of the following NFL season. Although the Patriots won the Super Bowl, the 2019 season won’t be kicking off in New England because the NFL has decided to shake things up for its 100th anniversary celebration. Instead of giving the Thursday night opener to the Patriots, the league decided to give the first game of the season to the Bears, who will also be celebrating their 100th anniversary of existence. The Bears will be hosting a Packers team that celebrated its 100th anniversary in 2018. If the league really wants to milk this 100th anniversary thing, it make it so only people over the age of 100 are allowed to attend the opener. The opening game of the NFL season will kick off on Sept. 5 from Soldier Field. Although the Patriots got booted from the Thursday night opener, you don’t have to feel bad for them, and that’s because the NFL is still giving New England a prime-time slot in Week 1. The Patriots will be opening their season on “Sunday Night Football,” which means America will get to watch them raise a Super Bowl banner for the third time in five years. The good news for everyone who’s not a Patriots fan is that Gillette Stadium only has room for seven banners, which means the Patriots are going to have to blow up their stadium and a build a new one if they win just two more titles. At least, I think that’s how that works. As for New England’s potential Week 1 opponent, the Patriots could host the Jets, Bills, Dolphins, Cowboys, Giants, Steelers, Browns or Chiefs, but only about half of those would be interesting. The guess here is that the Patriots end up playing either the Steelers, Chiefs or Cowboys. Even though the Patriots could technically host the Browns in the Sunday night opener, it’s starting to look like that won’t happen and that’s because it appears the Browns will be playing someone else in Week 1. Apparently, Odell Beckham somehow got his hands on a copy of the schedule, and according to him, the Browns will be opening the season against the Jets. For more details on that possibility, be sure to click here. The fascinating thing about this year’s set of games is that two of them will be played at the brand new Tottenham Hotspur Stadium in North London. The new stadium has a retractable field, which means that NFL games will be played on an actual football field, instead of a soccer field that has been modified to look like a football field. The other two games in this year’s International Series will be held at Wembley Stadium, which nearly became Jacksonville’s home away from home last year. Back in 2018, Jaguars owner Shad Khan tried to buy the stadium before pulling his bid in October. Mexico was supposed to get an NFL game in 2018, but that didn’t happen, and that’s mainly because the person in charge of the field upkeep at Estadio Azteca forgot to do their job. With the field in such bad shape, the NFL decided to move the Chiefs-Rams game from Mexico City to Los Angeles. Although it was an embarrassing situation for the NFL, the league will be sending two teams back to Mexico City in 2019. This year’s schedule will feature the Chiefs and Chargers playing at Estadio Azteca with Los Angeles serving as the home team. If you’re trying to figure out when this game might be scheduled, Week 12 would seem to make the most sense. In the past three years, the three games scheduled for Mexico City have all been played the week before Thanksgiving. Watching the Cowboys and Lions both play at home on Thanksgiving Day has become an annual NFL tradition and that tradition isn’t going to change in 2019, even if the Eagles want it to. Although the Thanksgiving schedule isn’t set in stone yet, there have been multiple reports about who will be playing on Turkey Day. According to the Sports Business Journal, the Cowboys will be hosting the Dolphins this year while the Lions will be hosting the Bears. (By the way, at the rate we’re going, Bears fans aren’t even going to have to wait for the schedule to be released and that’s because there seems to be a new announcement about their schedule every week. As things currently stand, the Bears will be playing in the NFL opener, they’ll be playing in London and they’ll be playing on Thanksgiving. Basically, get ready to see a lot of the Bears). As for the other Thanksgiving game, SBJ is reporting that there’s a chance the Vikings will end the Turkey Day triple-header with a prime-time home game against the Eagles. There’s always playoff rematches on the schedule, but this year, things should be extra exciting, and that’s because we’ll be getting rematches from some of the wildest postseason games from 2018. One of the most intriguing games will be played in Los Angeles when the Rams host the Saints in a rematch of an NFC title game that the Rams won 26-23 back in January. The officiating at the end of regulation was so ugly — the refs basically missed the easiest pass interference call of all-time — that the NFL completely overhauled its replay system in March. By the way, it’s probably for the best that this rematch is being played in L.A. because everyone in New Orleans still seems kind of bitter about that loss. Not only will we be getting an NFC Championship Game rematch this year, but there will also be a rematch of the AFC title game when the Patriots host the Chiefs. That game also came with some controversy. 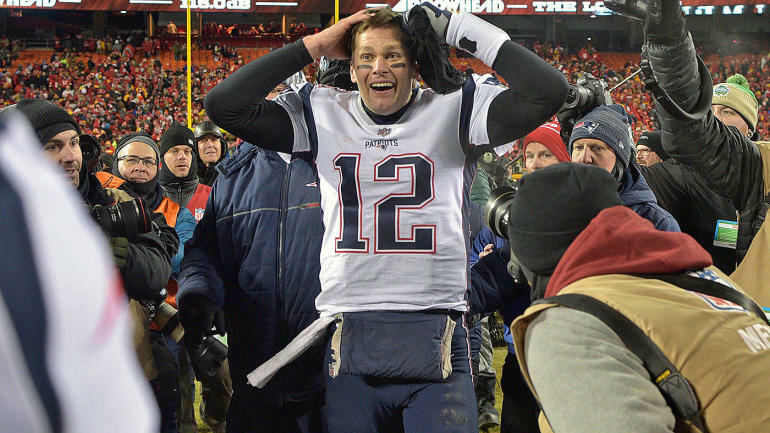 In a 37-31 win by the Patriots, Patrick Mahomes and the Chiefs offense never got to touch the ball in overtime. Chiefs coach Andy Reid has basically spent his entire offseason trying to get the NFL’s overtime rules changed so that each team gets a possession in the extra period. The Chiefs’ overtime proposal will likely be voted on at the NFL’s spring meeting in May. Of course, if the NFL’s smart, the league will implement the overtime auction rule that’s described below. No overtime will ever beat auction overtime. As for the other playoff rematches coming up this year, besides the two title games, there will be four other ones on the 2019 schedule: Colts-Texans, Bears-Eagles, Cowboys-Rams and Colts-Chiefs. If you like seeing a new coach get revenge on his old team, then 2019 is the year for you. Let’s start with Bruce Arians. The new Buccaneers coach will probably have the most awkward reunion with an old team this year when Tampa plays host to the Cardinals. Arians served as the Cards coach for five seasons, before retiring in 2017 to join the CBS broadcast booth. After one year away from football, Arians decided to make a return and was immediately hired by the Bucs. Things got a little contentious during the hiring process because the Cards thought they were owed compensation since Arians was still under contract with them. After investigating the situation, the league ruled that the Bucs didn’t owe Arizona anything since the Cards had declined Arians’ option, which ended his contract with the team. Adam Gase will likely also be out for some revenge. After being fired by the Dolphins in December, the new Jets coach will get two chances at revenge against his old team. Speaking of the Dolphins, their new coach is Brian Flores, who will also be looking to beat his old team. Before being hired by Miami, Flores spent 15 years in the Patriots organization. The AFC East won’t be having all the revenge games in 2019. Former Rams QB coach Zac Taylor will also get a crack at his old team when the Bengals face the Rams in London. Jon Gruden better make good use of those three first-round draft picks he has in this year’s draft, because the Raiders are going to need all the help they can get in 2019. Not only do the Raiders have the toughest strength of schedule based on how team’s did last year, but they also have the toughest strength of schedule using pretty much any scheduling metric out there. ESPN’s Mike Clay put together a strength of schedule projection based on how each team’s roster looked as of April 5, and guess who came out with the toughest schedule? Yup, the Raiders. Someone else put together a strength of schedule projection based on Vegas win totals, and once again, things are looking pretty ugly for the Raiders. Using win totals we can forecast 2019 Strength of Schedule. Patriots, Jets & Eagles have the 3 easiest schedules based on current win totals. Texans, Broncos & Raiders have the 3 hardest schedules. In that projection, the Texans have the hardest schedule, followed by the Broncos and Raiders. Based on the Raiders’ schedule, no one should be surprised if Antonio Brown has a full-on meltdown before the end of September. Although we don’t know the dates or times of the games on the 2019 NFL schedule, we do know who each team will be playing. You can check out the list of all 16 regular-season opponents for each team by clicking here. If you want to know why the Raiders’ schedule is so tough, all you have to do is click over and check out who they’ll be playing in 2019. When it comes to the schedule release date, the NFL hasn’t announced anything official yet, but we can take a stab at when the schedule might come out. For the past three years, the NFL has released the schedule on a Thursday, and for the past two years, the schedule has been released on the Thursday before the start of the NFL Draft. If the league sticks to that timeline, that means the schedule will be released on April 18. That being said, if the NFL schedule doesn’t come out by the end of next week (April 15-19), there’s a chance we might not see it until after the draft, and we can probably go ahead and blame the Raiders for that delay. The Raiders’ lease to stay in Oakland didn’t get finalized until March 15, which means the schedule-makers likely got a late start on putting things together. Of course, the NFL might have been thrilled about that and that’s because the Raiders’ issues would give the league the perfect excuse to move the release of the schedule to some time after the draft, which is something the NFL has apparently been thinking about, according to Bob Condotta of the Seattle Times. If the NFL does hold out until May to release the schedule, let’s all agree to blame the Raiders and retweet the guy below.